Located in a beautiful old Hilo neighborhood. Close to downtown. My husband and I met on the Big Island; married and moved into our Hilo home. After many years and several renovations we enjoy sharing our home with family, friends, and travelers from all over the world. Boogie board, Cooler, and Beach Chairs available upon request for guest use. We enjoyed our stay at the Arecas. It was quiet, clean and comfortable. Close to Hilo town, but far enough away to feel like you’re not right in town. The owner's ohana lived in Arecas for 9 years. It is very thoughtfully laid out and fully equipped with everything you would need to live there. Meals on the screened porch overlooking the lush private backyard are a delight. Situated high on a hill above Hilo Bay, in a quiet neighborhood, it is walking distance to Boiling Pots. 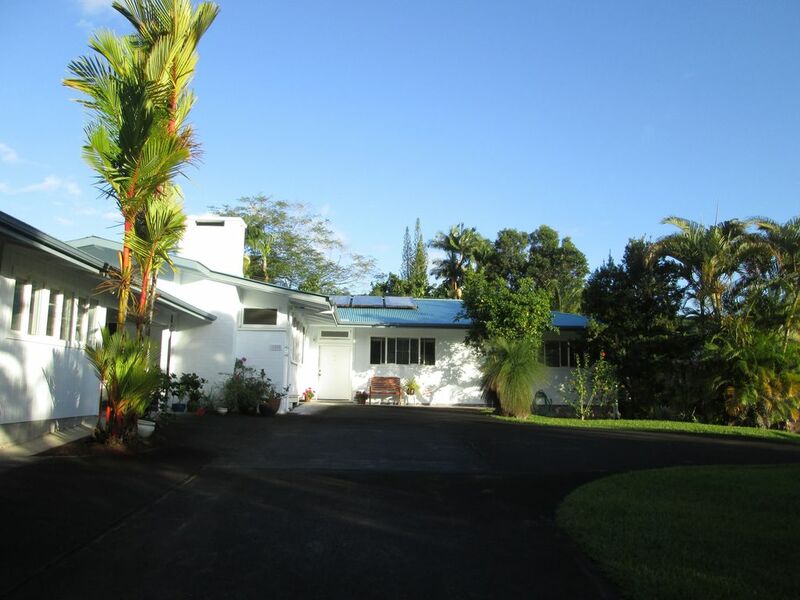 Arecas is a perfect home base, convenient to Hilo and Volcano. My husband and I enjoyed our three-week stay at the Arecas. The unit is in a quiet neighborhood but still close to downtown Hilo. We cooked breakfast each morning and many dinners too. The kitchen had everything we needed. We really enjoyed sitting on the lanai looking at the garden. The unit is cool in the morning and late evening, so be sure to bring a sweater. There is a nice air flow in the afternoon when the temps get warmer and we were never too hot. There were plenty of towels. The washer and dryer are new. The bed was comfortable. The hosts are very nice. What a relaxing 5 days we spent at this beautiful vacation rental 3 miles from downtown Hilo. The apartment was clean and well maintained, the kitchen was outfitted with the utensils one needs on a vacation; and the 2 bedrooms were light and nicely appointed. Sitting on the lanai was heaven.. and we enjoyed the birdsongs and gorgeous foliage so typical of Hawaii! Highly recommended! Everything was tip top except we needed a small heater in the a.m.
Beautiful accomodations including a stunning back yard. Lots of birds! Due to colder than usual weather, we needed a heater and none was available. Very quiet and private. If you book here, be sure to bring a warm jacket for the early morning hours. Very clean with well stocked kitchen. Excellent laundry facilities. About 10 minute drive to town. This is a great place as a base for the area. Very comfortable and well maintained. Everything you need to enjoy your vacation. Hosts are super friendly and accommodating. Highly recommend it. A "service fee" is charged by VRBO/HomeAway at time of payment. The standard rate is $109.00 per night for up to four guests included in reservation. No extra overnight guests. Quiet Hours are 10:00 pm to 6:00 am.